If you're on the look out for animal-free confectionery, there are a few things that you'll need to know. Many ingredients that are animal-derived or require animal involvement are difficult to detect. Manufacturers insist the additives are necessary to ensure that the products provide what consumers have come to expect. However, there are alternatives to many of these animal-derived ingredients. The following article takes a closer look at the issue of animal-free confectionery and how cruelty-conscious consumers can steer clear of tainted sweets. Those who want to adopt a vegetarian lifestyle may find it difficult when it comes to sweets. Labelling is not always clear or even complete. So many animal-derived ingredients exist that knowing them all would require extensive research. Food manufacturers sometimes react in different ways to vegan concerns. For example, Unilever has begun labelling food that contains animal products as "not fit for vegetarians." However, other large sweet makers are standing by their rights, announcing that there is no legal requirements to label foods as suitable for vegans. Often the animal additives found in confectionery are hidden behind inoffensive-sounding generic titles. For example, the ingredient capric acid (or decanoic acid) comes from animal fats and is sometimes found in ice cream and sweets, and is used to make fruit flavours. Lactic acid is a common ingredient that imparts a tart flavour to various sweets and desserts. This acid is formed by bacteria acting on lactose, which is found in milk. Since milk is obtained from cows, using lactic acid obviously requires involvement of the cow. Another ingredient frequently found in confectionery or sweet desserts in gelatine. This additive is made from the protein found in the skin and bones of animals. One of the top sources for gelatine is pig skin, but it also comes from cows. As you might have already guessed, gelatine is used in chewy sweets and fruit chews to make them - you've guessed it - chewy. It also makes it possible to manufacture crystal clear gel desserts. Gelatine has foaming properties that are essential in the production of marshmallows. 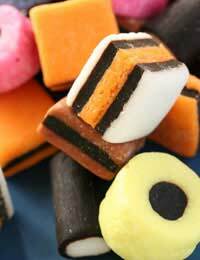 Finally, without gelatine, lozenges or hard sweets would not hold their shape. It's possible that some sweets you buy may be glazed with shellac. This ingredient is based on secretions from the lac bug. It is slowly being replaced with synthetic alternatives, but you may find it some confectionery. Although manufacturers are understandably anxious to keep doing things the same (after all, it saves money), it is possible in most cases to replace the animal products with a vegan alternative. For example, the much-used gelatine discussed above can be replaced with a mixture of maltodextrin and wheat gluten. A vegan alternative to shellac is carnauba wax, which is derived from palm trees. Until manufacturers are willing to fully disclose the animal products that they use when making sweets, it will be up to you to remain vigilant. Educate yourself about typical ingredients to watch for. Vegan and vegetarian groups often have helpful websites listing possible additives. When enough people start voting with their pocketbook, the market will come around to offering animal free confectionery! What is Tofu and How Can I Use It? Is Soy Milk Good for Me?